Huber’s Lane Shaw (background) discusses the multifaceted benefits of limestone in concrete formulations at last week’s ACI Fall Convention & Expo in Denver. At last week’s American Concrete Institute’s (ACI) Fall Convention & Expo, Huber Engineered Materials presented a key technical paper titled “Ground Calcium Carbonate (GCC) Production for Concrete Applications.” There’s no doubt the use of ground limestone is gaining traction as a partial replacement in white cement formulations. Information during the session centered around how ground calcium carbonate is mined and processed and then meets the proposed specs for concrete applications. Delivery options for the limestone was also an important topic discussed. Huber Engineered Materials offers a simple proposition to concrete customers: by partially substituting cement with HuberCrete® calcium carbonate, you are able to manufacture a brighter and stronger concrete product with less cement. Learn more today by contacting us and requesting a product sample. 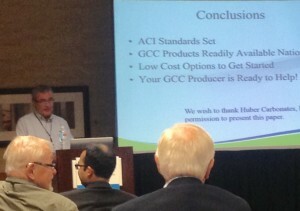 Thanks to those who stopped by our booth last week in Denver and attended our technical session. We look forward to working with you soon. Huber Exhibiting in Denver at Concrete Event! 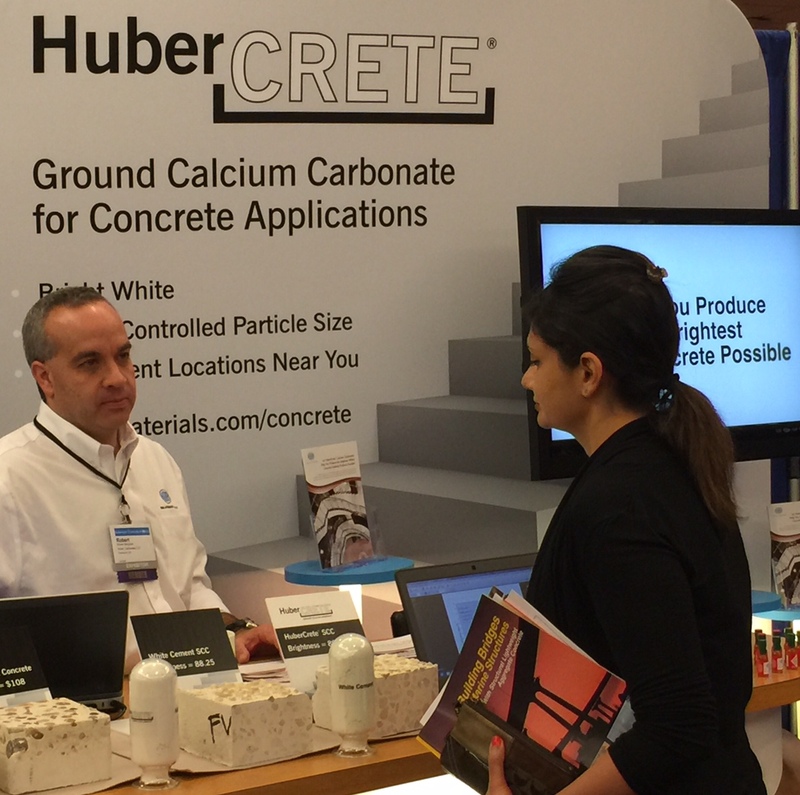 Huber’s Bobby Bergman (left) explains the many benefits of HuberCrete® ground calcium carbonate with an attendee at the American Concrete Institute’s (ACI) Fall Convention and Expo. This week, Huber Engineered Materials is in beautiful Denver (Colorado) exhibiting at the American Concrete Institute’s (ACI) Fall Convention & Expo. It’s our first time at the ACI event. The Expo began today and runs through Tuesday afternoon. We invite you to stop by booth 43 at the Sheraton Downtown Denver Hotel to learn more about HuberCrete® ground calcium carbonate. HuberCrete products are designed to give concrete better workability, an improved appearance and reduce the amount of cement required. No matter the concrete you require, HuberCrete ground calcium carbonate allows you very cost-effectively to formulate a white concrete product that will enhance your overall color and brightness without impacting the properties of fresh or hardened concrete. Stop by and see us at booth 43 in Denver!